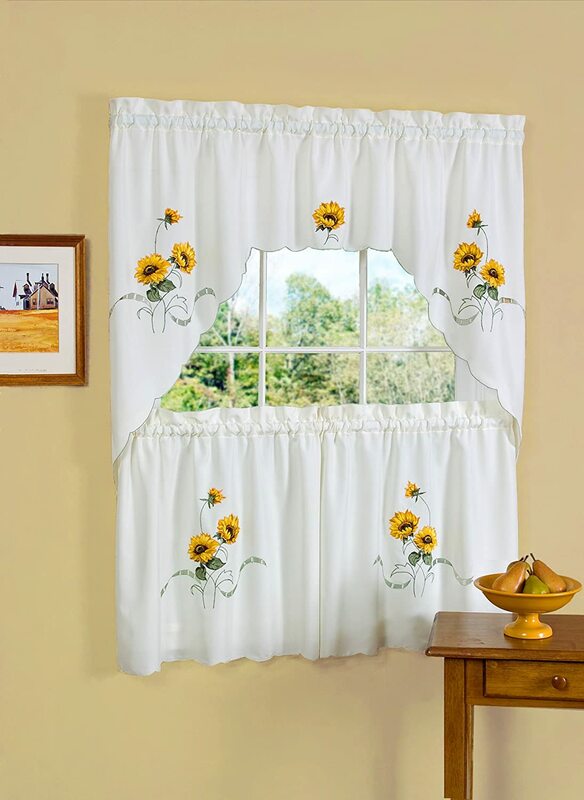 Bring in the sunshine to your home all the year round by having a sunflower kitchen decor theme for a bright, energizing and inviting room. These beautiful and bold flowers which come in happy shades of yellow, red and orange are the just the thing to add some energy and life to renew a tired, old or drab room. You only need to pick out a few, key pieces to give your kitchen a whole new look and feel. Create a wonderful and inviting space that everyone looks forward to come in to. 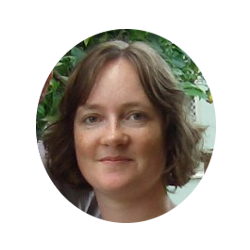 Note: This post contains affiliate links for which I may be compensated. 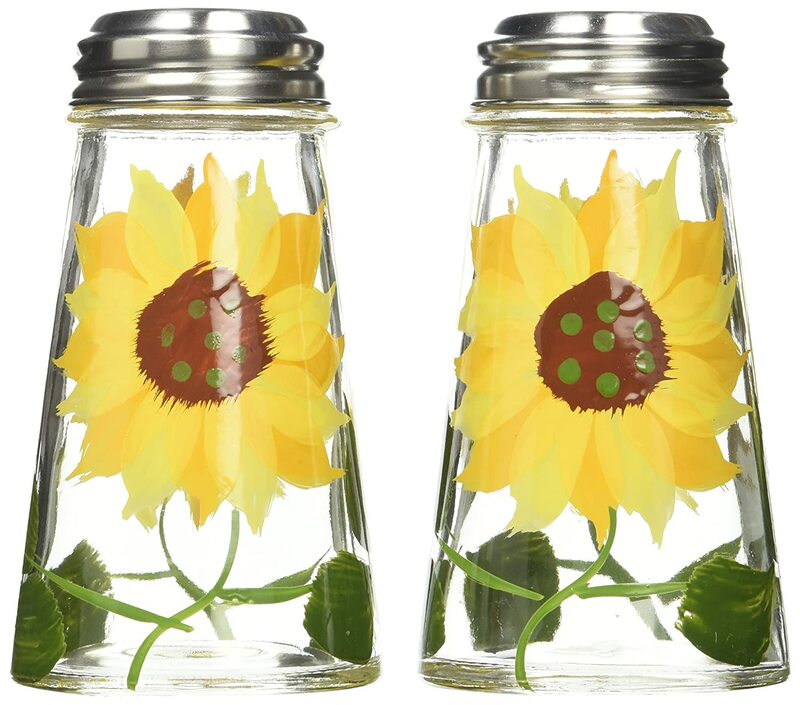 If you are breathing some new life into a tired an old kitchen, a great idea is to start by picking out a key accessory or piece of decor like this little sunflower tier and swag set. This set which features this pretty flower can then provide the inspiration that you need for selecting matching colors as well as decorative themes for your room. Having a larger and key piece like this gives you something with which you can match up colors and patterns such as paints, wallpapers, borders, tiles and more. Of course, it makes a great gift too for someone who loves these flowers. 1: Window and Wall Decal Stickers: There is absolutely no need to go to all the trouble and expense of repainting your walls unless they are totally the wrong look for your theme. 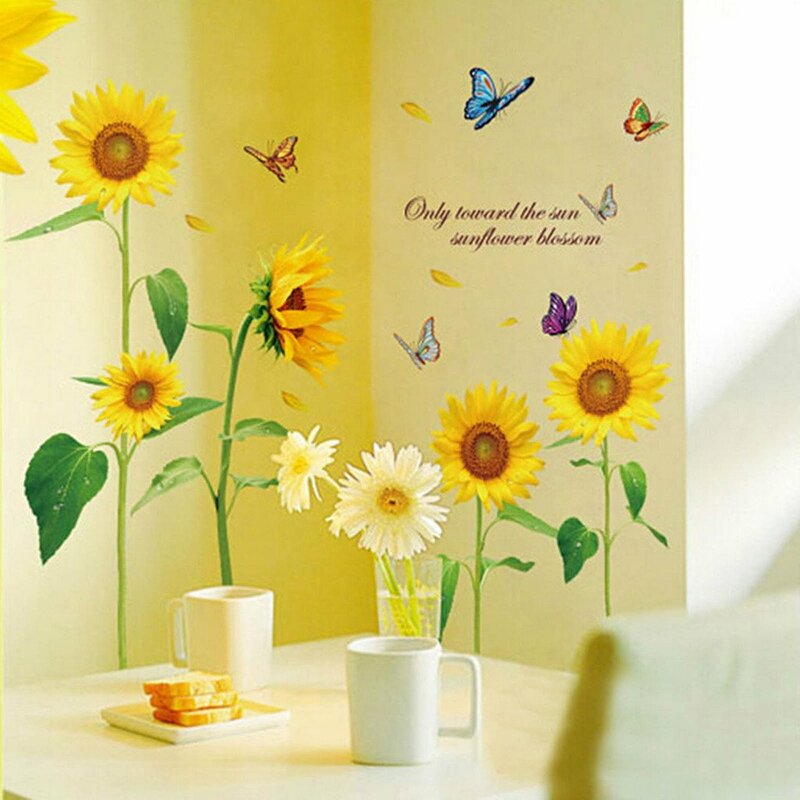 You can get hold of some amazing removable wall decals with this beautiful flower that can stick over the top of your painted wall. 2: A Sunflower Wall Calendar: Get a large sunflower calendar for the wall which is filled with images of this gorgeous flower. This is an easy and inexpensive way to decorate a space on the wall. A sunflower wall calendar is one of the easiest ways to inexpensively add a focal point to any wall in your kitchen. It is also really practical too. You should not tire of looking at the beautiful photographs each month. It's always a great idea to order some themed wall calendars for yourself or to put away as a gift for someone who could do with a dose of sunshine in their home all year. Often you can start to pre-order calendars for the following year in the early spring. 3: A Sunflower Wall Clock: You can get lots of wonderful looking wall clocks that feature this favorite flower. Pop this timepiece up on a wall to bring some detail to a bland area in the kitchen. A clock can create a focal point for guests to view as they enter your room. It can be a beautifully classical way to tell the time. Other kitchen wall decor includes decorative paper borders, clocks, plaques and calendars. Then you're all set. Wall decal stickers will generally work better on lighter wall backgrounds that have a plain white, cream or pale pastel painted covering. They are normally all made to be easy to remove (unlike wallpaper and paper borders) and can often be re-positioned if you change your mind or make a mistake with where you want the designs to go. You could brighten up a window with a poor view by filling it with a sticker print of Van Gogh's famous Tournesols painting. The colors and style of this print design would certainly suit a traditional country style or farmhouse kitchen. With a sticker or decal print, you can look forward to viewing your yellow flowers every day in the happy knowledge that these ones will not wilt and die. Window stickers are best applied where you don't have much of a view to look forward to. Perhaps your window overlooks a house or a wall. In this case it is much better to look at a vase of fresh sunflowers for an instant pick-me-up every day. Not everything in your themed room has to have a sunflower design. I would advise using the motif most definitely on the key items that you use or that are on prominent display in your home. Dinnerware such as plates, cups and mugs are all items which tend to get used a whole lot. I'd advise that you choose a really good set of dinnerware with a design that you love and want to enjoy every day. 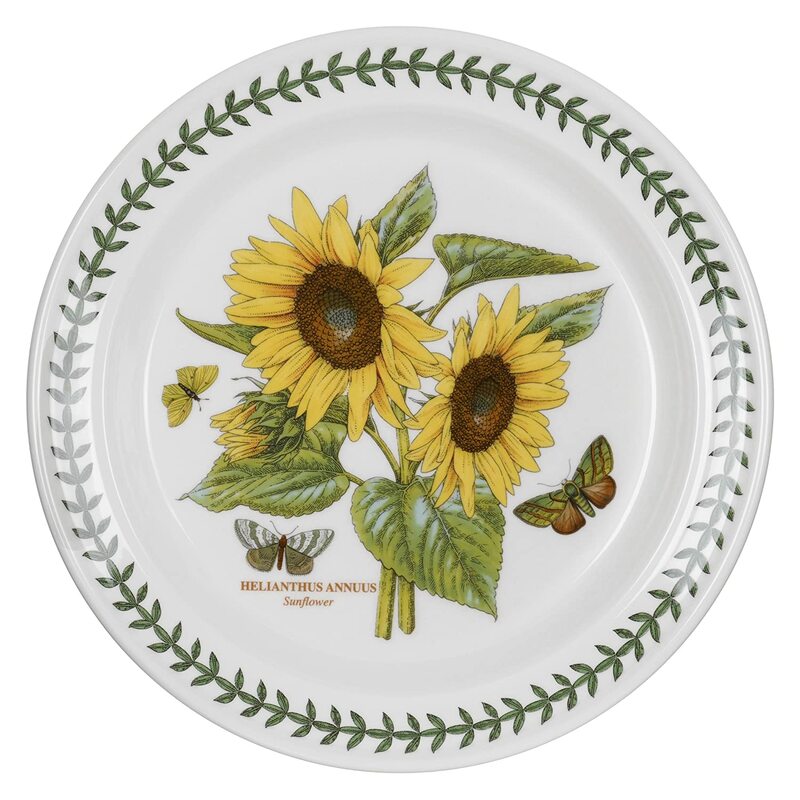 One great idea, to keep the cost down, is to purchase a set of dinnerware with the sunflower design of your choice but then mix and match these with some less expensive solid color dinnerware sets. Look for a nice solid color in a creamy yellow if you're going for a sunny look or light brown or orange-red for that rustic and country style. That way you can get the dinnerware set that you want on a much smaller budget. Shaped sunflower platter. This looks like such a wonderful themed centerpiece to have in your kitchen. What an amazing looking piece of dinnerware. This is an incredibly unique piece to have out on display or even to hang up on the wall. It is made of hand painted ceramic and glazed so it can reflect light around the room too. Dinnerware accessories are the items that will usually be left out on the kitchen table or on the side such as butter dishes, salt and pepper shakers, sugar and creamer sets, teapots, tureens and platters. Sometimes it's the accessories and the attention to detail which make all the difference when creating a gorgeous floral themed kitchen. These accessories also make great gifts because they are not the common, everyday items (like the plates and cups we use) that people will have already. 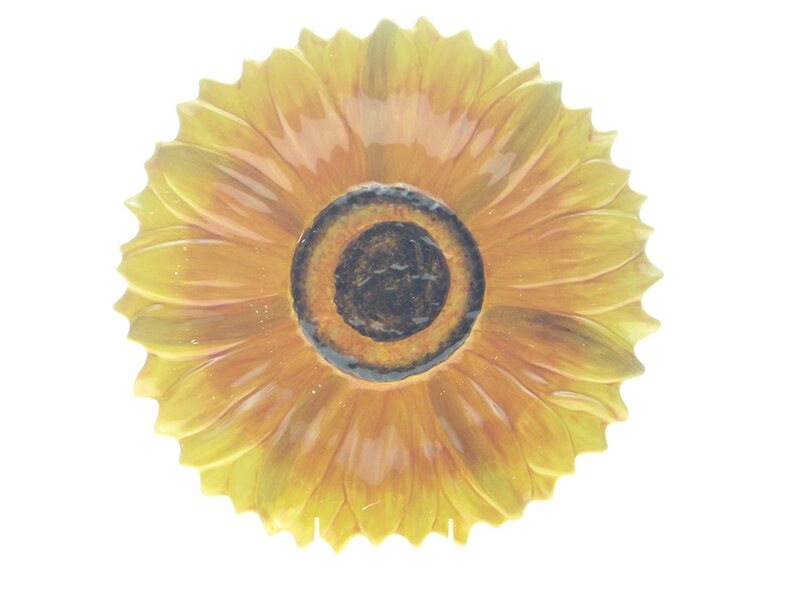 If you do purchase an extra sunflower platter, for example, you can bet it will get used or put out proudly on display. It's often the smaller accessories for a kitchen that can make for some great gift ideas: salt and pepper shakers, butter dishes, sugar bowls and creamers. These all make sweet gifts for a friend or for someone who adores this wonderful flower. I found some bright blue and yellow plates (not pictured) which look amazing. They are made from Melamine which is harder to break than china or porcelain plates and I just think how brilliant this bold and cheerful piece would look on display somewhere. Plates can either mounted up on the wall or displayed out on a shelf or table. What an instant way to use this flower to add in a real splash of color and vibrancy to the home. Whatever your choice of drinking vessel, whether it be mugs, cups or travel bottles, sipping from a container decorated with this beautiful flower should be a real pick-me-up. Soft furnishings can really help to transform a space completely. New curtains, a rug, some plump cushions and even some themed fabric to make your very own items can create a warm and cozy place where people want to sit, eat and chat rather than hurry on away. Cushions and throw pillows are great because they can give an instant and inexpensive warm boost to any room in the home. They are perfect to sit on when you have hard seating, prop them up against your back for comfort and arrange them around your room to give it a more homely and comfort look and style. A beautifully designed sunflower throw pillow can transform any dull room or tired sofa instantly with its bright summer sunshine colors and warm, inviting tones. 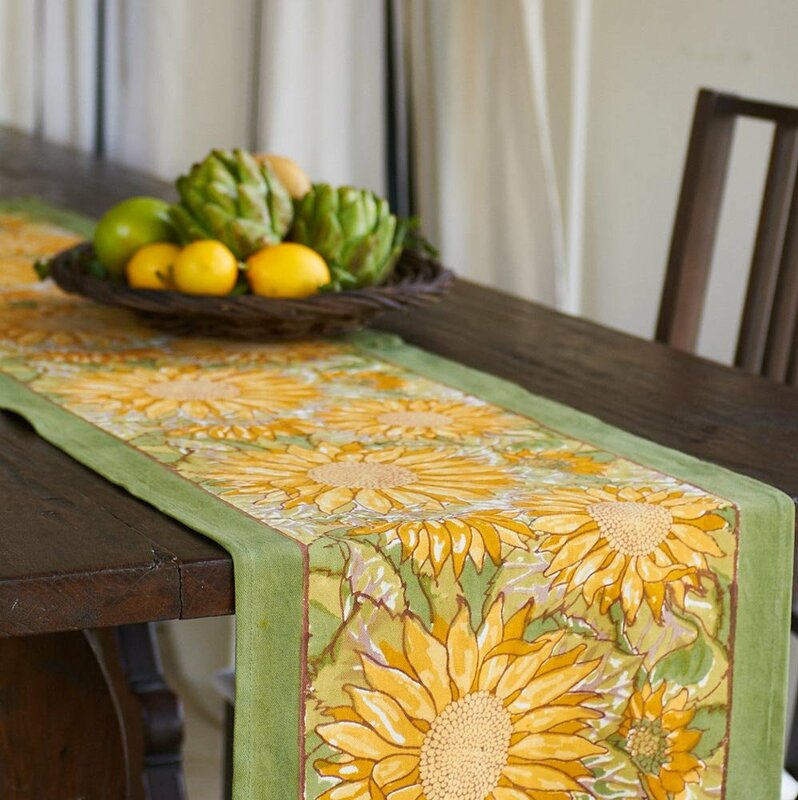 If you want to quickly furnish your home with themed kitchen accessories, look for an appropriately designed sunflower tablecloth. Other large soft furnishings such as curtains and rugs will also make an immediate impact on the theme of your room. 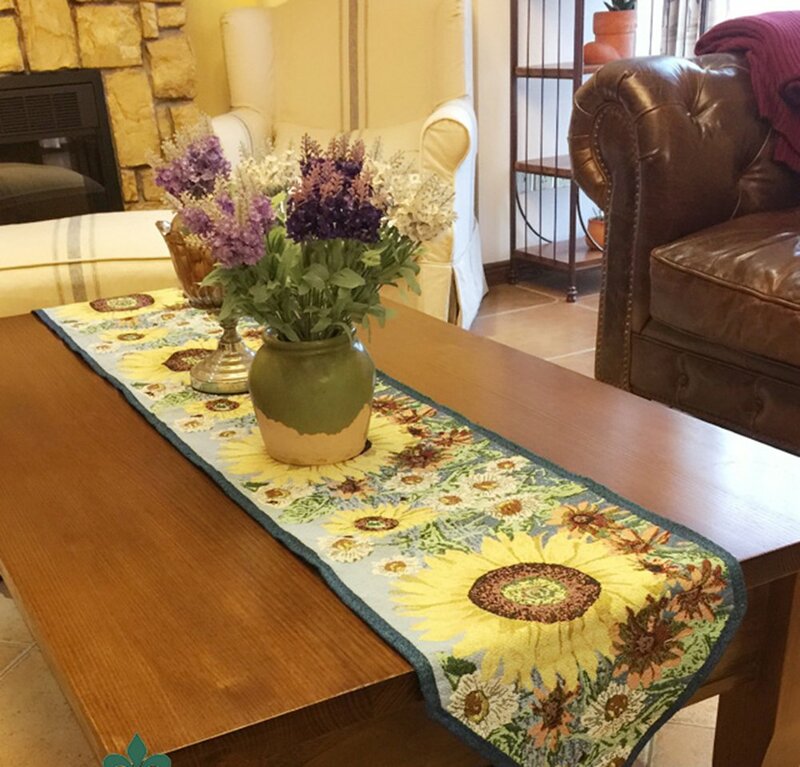 If you're purchasing a tablecloth as a gift do take care that you know the measurements of the table which it's supposed to fit. Someone bought us a gorgeous tablecloth as a wedding present which we could never use because it was for an oval table when we had a round one. So it was much too big. For anyone who cooks up a storm and tends to get messy quickly, having an apron that is not white or pale cream is a blessing. As for towels, mitts and pot holders, these are definitely the items which often need to be replaced in the home because they do get worn and grubby with time. So these items always make great gifts. I know I love it when people buy good quality towels and mitts. Other brilliant ideas for decor and accessories to adorn your kitchen walls include decorative paper borders, bright and bold sunflower clocks, wall plaques and even calendars. Many of these items can become really good focal points for a room in your home. A happy, sunshine-filled space will ensure somewhere that you and all your nearest and dearest can enjoy being in. 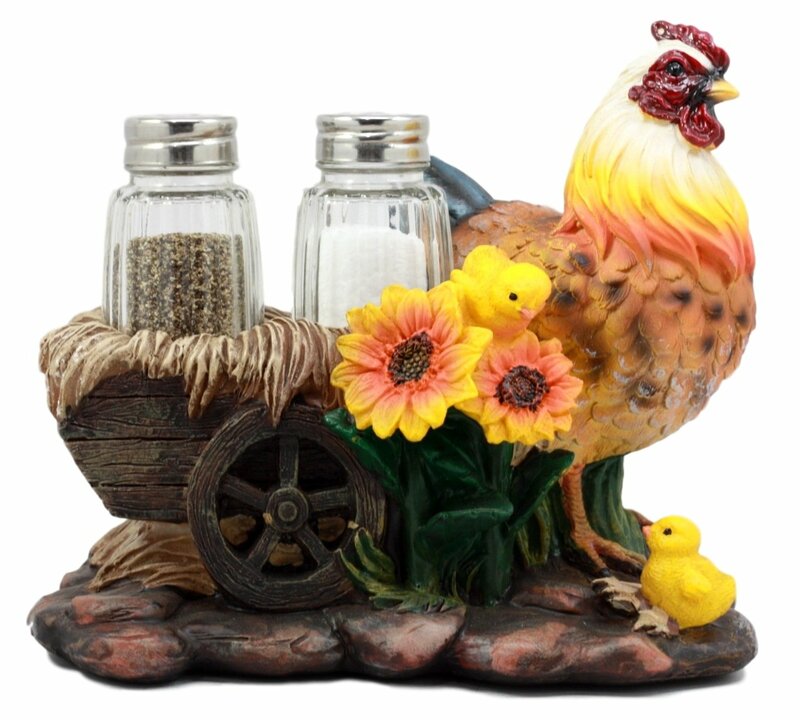 If you enjoy a more rustic country farmhouse style, you can opt for many wonderful rooster and sunflower designs for the kitchen. There are some gorgeous items including a double-sided flag which you could pop just outside your kitchen to enjoy viewing through the window. This scheme matches in well with a selection of rooster and sunflower decal stickers. 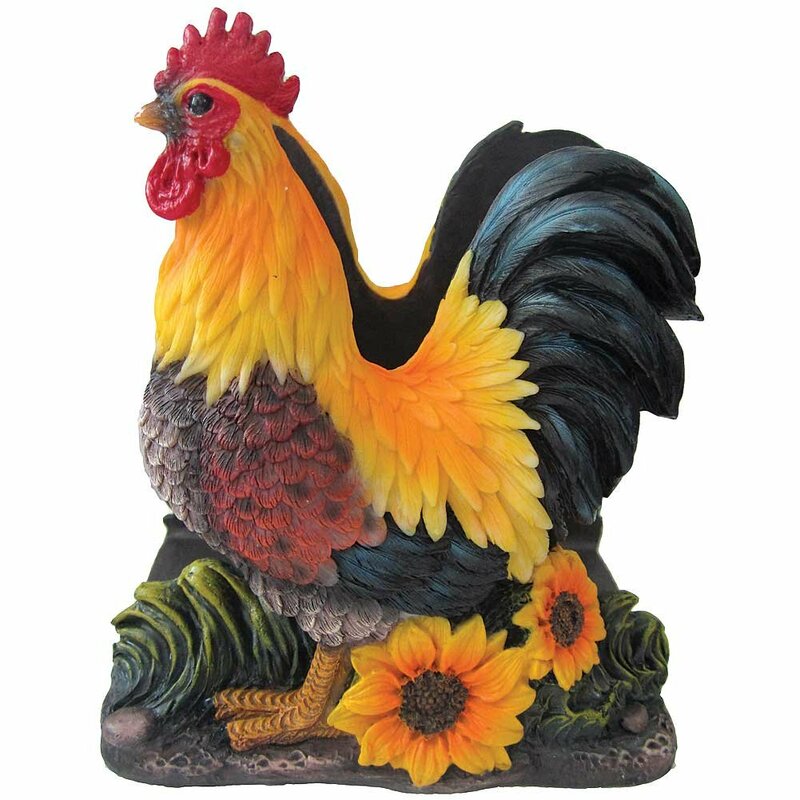 Roosters always work well with a sunny, country theme and are a really charming motif for a room. The colors in this scheme are absolutely perfect for the Fall season and Thanksgiving in particular. The kitchen is one of the most important places in the home so lets make it somewhere you don't want to leave in a hurry. By selecting some carefully chosen decor and accessories, you can help to transform this space so that it soon becomes the real heart of your home. Hi, I'm Marie. SunflowerJoy is for people like me who love the bright, beautiful and blooming yellow sunflower. Facts, information, quotes and gifts to celebrate this bold and brilliant flower which follows the sun. 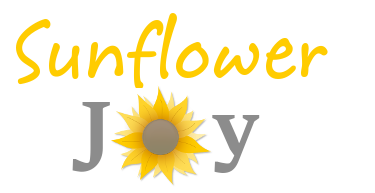 SunflowerJoy.com is a participant in the Amazon Europe S.à r.l. Associates Programme, an affiliate advertising programme designed to provide a means for sites to earn advertising fees by advertising and linking to Amazon.co.uk.